I can't believe November is finally here! Turkeys, leaves, and crisp air, planning for the big holiday meals and all the decorating...I'm so excited for it all! This week we had more than 120 link ups! Let's try to top that this week. I love the projects each week and as usual, it was difficult to pick features. 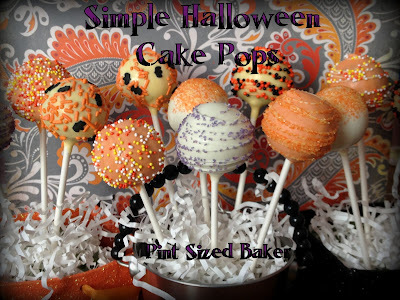 The whole cake pop thing is beyond my skill level...but the Pint Sized Baker offers up some tips on how to overcome that. Little Lady Bird created a project that captured my Little Miss' attention. A castle made out of box. Super cute recycling! I'm a huge fan of Asian food. It's usually very healthy and I almost always have the ingredients on hand. The Jazzy Gourmet offered up a unique twist on one of my favorites...and created a Spaghetti Squash Pad Thai! Before we link up the party, please follow the hosts: Jane, Marilyn and Micki. ♥No more than 3 projects linked up. ♥Spread the word about the party! The more the merrier! That means link up the party via our button or a text link. Thanks for featuring my Tips on making Cake Pops at your party. I'll be adding your button to the post. Hope you had a good Halloween night! On Sunday I'll be co-hosting a party and would love for you to come on by Pint Sized Baker . Thanks so much! Thanks for the invite. I am following you and have linked up a few. Is there a button to grab?